The National Print Museum offers an exciting range of activities, events, workshops and educational resources for families and children. Through three fun and interactive activities and working directly with artefacts from the Museum’s collection, families learn about a selection of the traditional printing machines, are given the opportunity to experience traditional hand-setting and printing and using the Japanese paper craft of origami learn how to make and decorate their very own printer’s hat. At the close of the tour, parents can avail of the engaging audio-visual presentation which gives them a unique opportunity to see demonstrations of a number of the printing machines in the permanent exhibition, along with a description of how they work from the Museum’s dedicated active retired volunteers. For more information on how to book a Family Tour please visit our Guided Tours booking information page. Families and children can discover the creative world of printing every day at the National Print Museum’s Education Area. Launched in May 2012 and supported by the Aviva Stadium Community fund, the Education Area was handcrafted by a local artist, Andrew Clancy, and is situated on the mezzanine level of the Museum. All activities are free, self-guided and encourage family learning and interaction. Activities include arts and crafts (ink stamping, light box picture tracing, stencilling, easy origami, drawing & colouring), alphabet games for the tiny tots, activity sheets and reading from our wonderful Junior Library. We run a number of free activities for children at our Education Area including Storytelling for children aged 3 – 7 years. To find out more about this exciting space please contact our Education Officer and visit our Events page for our upcoming Education Area programming dates. During Family Fun Day’s the Museum becomes a hive of activity with printing demonstrations from our volunteers, printer’s hat-making, ‘Wanted’ poster printing, self-guided arts and crafts activities at the Education Area, mini children’s workshops in printmaking or bookmaking and face-painting. The Museum runs at least two such events each year and admission plus all activities are free. Please keep an eye on our Events page for upcoming Family Fun Day dates! 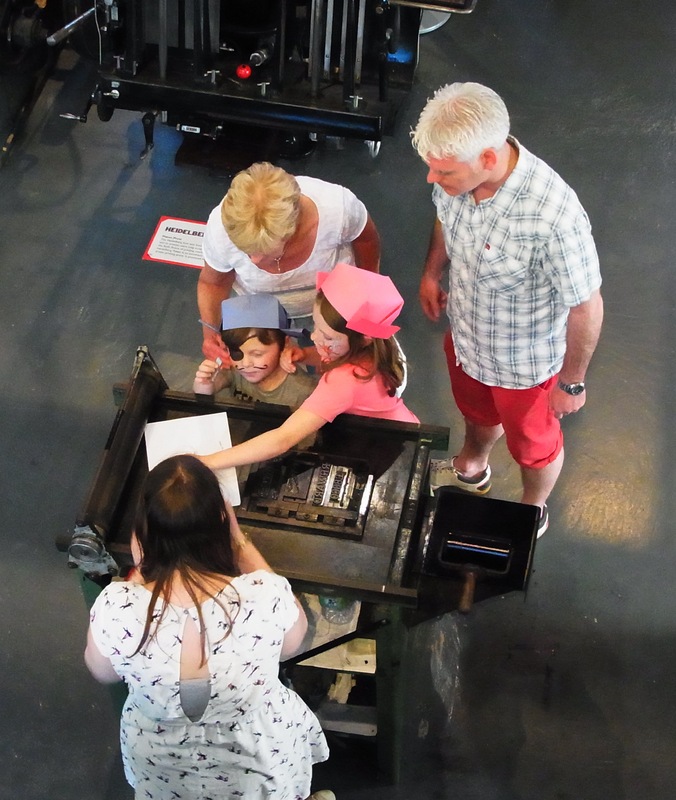 The Museum’s Printfest Family Fun Day was shortlisted for the Heritage Week Event Organisers Cool for Kids Award in 2015! We run a number fun and engaging arts and crafts workshops for children of various ages. Where possible we aim to run these workshops during the school holidays. All are facilitated by our Education Officer and include Bookmaking, Printmaking, themed workshops such as Christmas, Easter and Halloween Crafts and a number of special bespoke workshops created to celebrate national events such as Open House Junior. The cost of these workshops ranges from €10 – €15. Keep an eye on our Workshops page for upcoming workshop dates! Through three fun and interactive activities and working directly with artefacts from the Museum’s collection, children learn about a selection of the traditional printing machines, are given the opportunity to experience traditional hand-setting and printing and using the Japanese paper craft of origami learn how to make and decorate their very own printer’s hat. This tour is very similar to our Primary School tour and is suitable for children aged 7 – 12 years. Groups such as Scouts, Brownies, Cubs, Beavers, Summer Projects and Camps and After School Clubs have all thoroughly enjoyed the Museum’s children’s tour! For for information on how to book a Children’s Interactive Tour please visit our Guided Tours booking information page. The Museum offers an exciting activity based birthday tour for children aged between 6 – 12 years. Please contact education@nationalprintmuseum.ie for more information. Advance booking of at least 2 weeks is required for all birthday tours.